Secretary-General António Guterres addressing the annual United Nations Holocaust Remembrance Memorial Ceremony in the General Assembly Hall. “From a deadly assault on a synagogue in the United States to the desecration of Jewish cemeteries in Europe, this centuries-old hatred is not only still strong – it is getting worse” Secretary-General António Guterres said in his commemoration message, pointing to “the proliferation of neo-Nazi groups, and attempts to rewrite history and distort the facts of the Holocaust”. Under this year’s theme: “Holocaust Remembrance: Demand and Defend Your Human Rights”, youth are being encouraged to learn valuable lessons from the Holocaust, such as acting forcefully against discrimination and defending essential democratic values. With neo-Nazism and hate groups on the rise, together with other forms of hatred around the world, the theme also highlights the 70th anniversary of the Universal Declaration of Human Rights and the Convention on the Prevention and Punishment of the Crime of Genocide. 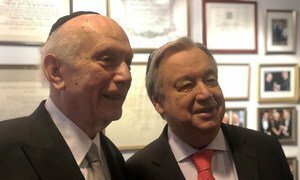 Mr. Guterres recalled the quote by former Chief Rabbi of the United Kingdom, Jonathan Sacks: “The hate that begins with Jews never ends with Jews”. “We see bigotry moving at lightning speed across the Internet”, underscored the UN chief, pointing to “intolerance entering mainstream politics – targeting minorities, Muslims, migrants and refugees, and exploiting the anger and anxiety of a changing world”. “Now more than ever, let us unite in the fight for universal values and build a world of equality for all” concluded the Secretary-General. Participants at the 2019 United Nations Holocaust Remembrance Ceremony. As part of a week of commemorative activities, a ceremony on Monday in the General Assembly Hall featured first-hand testimony from survivors, memorial prayers, musical elements and a keynote address from Sara J. Bloomfield, Director of the United States Holocaust Memorial Museum, who after 18 years, continues working to raise Holocaust awareness, deepen the understanding of its hard-learned lessons, confront denial and advance genocide prevention. The ceremony was hosted by Alison Smale, UN Under-Secretary-General for Global Communications. 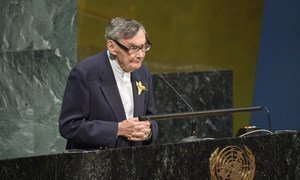 Danny Danon, Permanent Representative of Israel to the United Nations; Jonathan R. Cohen, Chargé d’Affaires, United States Mission to the United Nations; and Ambassador Sandro De Bernardin, the Chair of the International Holocaust Remembrance Alliance, also delivered remarks. From the Hall, Mr. Guterres drew attention to what he called “the worst anti-Semitic attack in the history of the United States, when 11 worshippers observing Shabbat in Pittsburgh were murdered at the Tree of Life synagogue last October. “We must rise up against rising anti-Semitism”, he stressed. In her remarks, General Assembly President María Fernanda Espinosa spoke directly to the survivors, saying she was deeply humbled and touched by their presence at today’s ceremony. “Most of us in this room can never understand nor begin to realize the impact of that horror on your lives. Records and recordings, documentation and recollections, can never tell the full story of one of the worst tragedies in human history,” she said. “We must draw lessons from history; this is why it is so vital that we remember the Holocaust and honour the victims of that atrocity,” she declared, adding that she believed that only through remembrance and education could the hatred of others, the demonization of groups and the cynical manipulation of opinion that promoted such hatred and violence, could be countered and stopped. María Fernanda Espinosa Garcés, President of the seventy-third session of the General Assembly, makes remarks during the 2019 Holocaust Remembrance Ceremony. “As leader, as citizens. As people of faith and of conscience we need to stand up for what we believe. Our survival as a modern civilization, based on the rule of law and human rights and respect for the dignity every individual depend upon it,” she said. As part of a week of commemorative activities, a ceremony on Monday in the General Assembly Hall featured first-hand testimony from survivors, memorial prayers, musical elements and words from Sara J. Bloomfield, Director of the United States Holocaust Memorial Museum, who after 18 years, continues working to raise Holocaust awareness, deepen the understanding of its hard-learned lessons, confront denial and advance genocide prevention. In other events, an exhibition called “Beyond Duty: Diplomats Recognized as Righteous Among the Nations”, shared the unique stories of the diplomats who, serving under Nazi regimes, saved Jewish lives by providing passports, visas and travel permits for their escape. “Only through multilateral action and cooperation can we move closer to achieving a world of safety and dignity for all people, everywhere”, Mr. Guterres said at the launch. A presentation on a lesser-known chapter from Holocaust’s history about the haven some Jewish refugees fleeing Europe found in India was scheduled as part of the day’s events, and a second exhibition of photographs called “Bracha. A Blessing. Back to Polish Shtetls”, was unveiled, documenting the journeys taken by Jewish descendants from Poland, back to their birthplaces, to pay homage to the culture and heritage they were forced to leave behind in the form synagogues, graveyards and the graves of Tzadikim, or “the righteous people”. For a full list of events, please click here and for some useful historical background, go here.